The more I worked on a tree as an example for this tutorial, the more complex the whole thing kept getting. Rather than try to explain in gory detail all that went on in the Deep Texture Editor, I've decided to provide a copy of the branch object for you to download and study. There are notes below concerning some of the more important Deep Texture Editor tricks involved in the branch material. 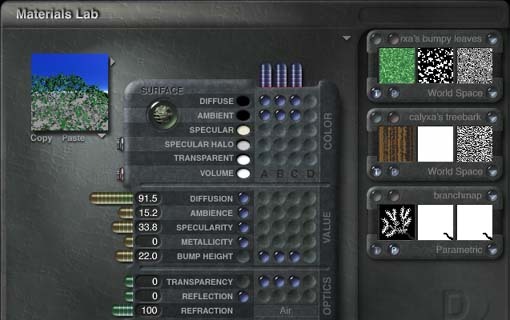 If you are already familiar with the Deep Texture Editor, you may find enough information here without downloading the sample branch. You must have updated to Bryce 3.1 or have Bryce 4 in order to load the branch correctly. The sample branch is a Bryce object (.obp) file. To use it, go into the Object Presets dialog (click the triangle next to 'Create') and then import the file 'calybranch.obp' into the category of your choice. Once the branch has been imported, you can create one and add it to a Bryce scene. Then, go into the Material Lab to study the branch material in depth. This tutorial concentrates on how the branch was made, starting with a symmetrical lattice object. A dark grey 'trunk' of the branch should extend all the way into one corner of the terrain editor canvas. Change the terrain grid to 256 for drawing details, then after it is drawn, change it back down to 128 or even 64. Detail in the trunk part of the branch will break down around 32 grid, but the trees in my Golden Tree Walkway v.2 use 32 grid lattices. It is OK to have abrupt transitions between shades of grey. Finish it off with lots of white leafy protrusions on the non-trunk edges. This is the same branch mask as is used in the sample branch. The easiest way to make the branch mask is to copy and paste the branch g2h into a photoshop document, then use the magic wand tool to select the dark grey 'trunk' portion of your branch. The branch mask maps out which parts of your branch get the treebark part of the branch material. This is where things get really hairy. Go into the material lab. If you're playing along with the sample branch, notice that ABC mode is used for Diffuse, Ambient, Bump Height and Transparency. You may want to review my tutorial The ABCs of Naturalistic Marbles for more on ABC mode. Here's the material lab with the final branch material in it. I'll talk about each component separately below, starting with C and working backwards to A. Component C is a picture texture and uses the branch mask you prepared above in Step Two. The only part that really matters is what ends up in the center preview swatch. I noticed that while I was in photoshop, my alpha channel was white where the branch was and black everywhere else, but when I imported it into Bryce, it inverted itself and ended up black where the branch was and white everywhere else. The mask should contain only black and white, no shades of grey. Where the mask is white, texture A is applied. Where the mask is black, texture B is applied. The mapping should be 'parametric' by default because it is from a picture source. 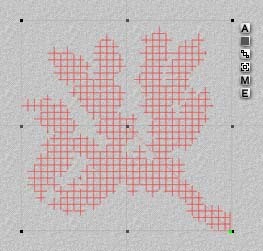 If you want to use this material on your own branch, simply replace the picture in texture C with pictures derived from the shape of your branch g2h. Again, it is the center swatch that concerns us the most here. Using ABC mode to drive transparency first tells Bryce to use the information in Texture C to decide where the final material should use transparency from texture A and where it should use transparency from texture B. But the parts of the object which are to use texture B shouldn't be transparent at all, so the alpha information in texture B needs to be all white. This texture creates the leaves, so the idea is to make discreet white areas in a black background. It is also important to make sure the mapping is 'world space.' This way there can be large and small copies of the same branch to make up one tree and all the leaves will be a uniform size (as opposed to having large leaves on the large branches and tiny leaves on the tiny branches). Wow, after all that material stuff, this step will be really easy! Exit out of the DTE and material lab when your head is spinning too much from looking at the sample branch material. Bring up the object attributes dialog for your branch. I like to change the name of the lattice to 'branch 1' at this stage, but what we're really here for is to turn on the 'show object origin handle'. After you've turned on the origin handle, you'll want to move it from the center of the lattice to the branch end which went off the terrain editor canvas at a corner. So far, we have not moved the lattice object at all, so this is best accomplished in top view. If you haven't used object origin handles before, it is the bright green dot shown in the picture to left. The picture also shows where the origin handle should be after it is moved to the 'trunk' end of the branch. This is also how the origin handle for the sample branch will look, though I believe the sample branch has been rotated. This branch is a lot denser than others I had worked with before so it took fewer lattice branches to make a decent looking tree. The wireframe tree to the left consists of 8 symmetrical lattice objects all at 128 grid. Two of those are for the trunk and they are a boolean 'miracle tree' group. The other six branches are all duplicates of the sample branch, stretched to a variety of sizes. Switch between 'World Space' and 'Object Space' with the editing tools as the branch is rotated in space to put the branches at different angles. The branch will rotate about the origin handle. The 'trunk' portion of the branch can be moved to touch the trunk and any rotation will leave the origin point alone still within or touching the trunk. For some earlier trees I made with similar methods, the branches were not as dense (fewer little leafy white protrusions). 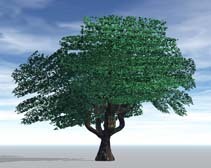 When I made trees from those branches, I multi-replicated the first branch five more times rotating around the Y axis at 60 degree increments. Then, make a group of those six branches, copy and paste it, then use the page-up key to raise the new branches above the old. Often I'd make one more set of six branches. 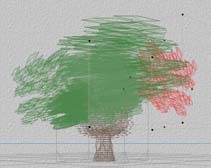 Then I'd use the randomize tool set to '3D Size, Disperse, Rotate' a few times after which I'd have to re-collect my branches to a clear area of the scene file. But that would give me several different sizes of branch which assembled back into a tree fairly quickly because the visible origin point makes it easy to line up the branch and trunk.